Two bedroom tri-level townhouse-style holiday rental measuring 1069 square feet. On the upper level, you will find a living area with queen sleeper sofa and a full kitchen. On the middle level is a bedroom with 2 twin beds and a full bathroom. On the lower level is the master bedroom with king sized bed, and a full bathroom with a jacuzzi tub. The condo has a washer and dryer, gas fireplace, and deck with mountain views. Sleeps 6 people. and feature an “A or large 1BR side and a “B” or small 1BR side, which may be rented together or alone. All units have a mountain or garden/wooded view patio or deck, and a washer and dryer in the condo. On the SBS floor plan, the large 1BR “A” side provides 715 square feet, and features a bedroom with king bed, a bathroom with a tub and shower and a separate room with jetted jacuzzi tub, a full kitchen, a living area with full sofabed, and a gas fireplace. The small 1BR “B” side provides 460 square feet, and features a bedroom with queen bed, a bathroom with a tub and shower, a full kitchen, a living area with full sofabed, and no fireplace. Each side sleeps 4 people for a total of 8 people for the 2BR lockoff. On the OU floor plan, the large 1BR “A” side is upstairs, and provides 666 square feet, and features a bedroom with king bed, a bathroom with a jetted tub and shower, a full kitchen, a living area with full sofabed, and no fireplace. The small 1BR “B” side is downstairs, and provides 521 square feet, and features a bedroom with king bed, a bathroom with a tub and shower, a full kitchen, a living area with full sofabed, and no fireplace. Each side sleeps 4 people for a total of 8 people for the 2BR lockoff. Free wireless internet Wifi is offered in all lodging accommodations. Total price shown includes tax and cleaning. Save renting through us. Compare our prices to these weekly rates found at Wyndham’s rental website http://www.extraholidays.com: 1BR $1417, 2BR $2036 per week. 2,200 Acres of Flagstaff Fun. Wyndham Fairfield Flagstaff Resort, located in Northern Arizona’s high country, offers you a neighborhood-style “home away from home” with a full range of resort amenities and activities right on site. Great activities center with lots of planned and freeform activities for young and old alike. 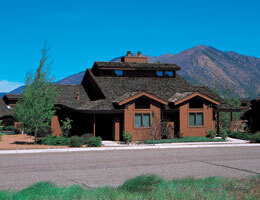 It’s easy to enjoy a wonderful stay at the Wyndham Fairfield Flagstaff Resort without even leaving the grounds. When you do head off site, you’re close to so many of the popular sights and attractions that make this region such a highly sought-after vacation spot — including the Grand Canyon. There are 8 National Parks and Monuments within 2 hours drive of the resort: Grand Canyon, Walnut Canyon, Tuzigoot, Sunset Crater, Wupatki, Montezuma’s Castle, Montezuma’s Well, and Petrified Forest.